This is a question that I pose to my 4-year-old son during his nightly bedtime routine. Should he choose the blue toothbrush, it won’t make his teeth storybook-white. Should he choose the red toothbrush, it won’t spiral his chompers into a rabbit hole of tooth decay. Instead, this question has one simple goal: to teach my son to make decisions. He weighs his options nightly. He senses that he has a choice in the matter. I’m no parenting expert or psychologist, but as we all have, I’ve dabbled in teaching decision-making to my children, and I am a fan of the “Laurence Fishburne” method. In that infamous red-pill-blue-pill exchange between Morpheus and Neo, there is a singular but hidden beauty: Neo doesn’t have a choice. At the time that Morpheus found him, Neo was destined down the rabbit hole, one way or another, much like my son will inevitably have to brush his teeth each night. But by providing my own little Neo with a choice as opposed to simply demanding it, or worse, asking “Do you want to brush your teeth now?” (a question which would undoubtedly be answered with a “no”), I can provide only the outcomes that I find acceptable while still making it his idea. Think about it this way. What happens when you ask your child: “Are you ready to brush your teeth?” 99 out of 100 kids will say “NOOOOOOOOOOOOOOO” or “I don’t want to brush my teeth”, or they may just run away from you and hide under the kitchen table. Sometimes a total meltdown may begin. 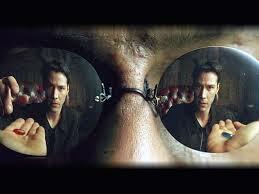 If Neo were presented with a yes or no option, he may have decided to get the hell outta there and the mystery of what was on the other side would be left unsettled, and viewers across the globe wouldn’t have had the pleasure of seeing Keanu’s acting in not one but three of these glorious Matrix films. When you ask your child questions that present acceptable outcomes, but give your child a say in how they want to execute, they still believe the idea is theirs. It’s the same negotiation tactic you may use when working a deal in business or making a large purchase. It’s planting the seed for what you want, but putting the terms out in front of the other individual and allowing them to feel confident in the ability to “have the final say”. The hubs and I use this tactic for many things with our kids. Do you want to read a book before bed or play for five minutes? (Either way you are going to bed in five minutes.) Do you want to wear this shirt or that shirt? (Either way, we are not leaving the house with you shirtless.) Which shoes would you like to wear? (Either way, you aren’t leaving this house barefoot.) I’ve found this helps to to redirect my child’s attention away from the negative aspects of a particular act or behavior (“But I don’t want to brush my teeth!”) . I truly believe my kids feel more like a grown-up, and confident in their ability to choose. Sooner or later in life, we all have to learn to make decisions, whether they be as simple as which toothbrush to buy or as difficult as whether to start over in a new city and take that dream job. Why not give your kids a step up and start them early? Giving them choices at an early age helps them have a knack for the decision-making process, and it leaves you with a few less meltdowns to clean up after. Next What is that smell?